From The August 1997 Issue of Aletheia. The habit of reading is absolutely critical today, particularly for Christians. As television turns our society into an increasingly image-dominated culture, Christians must continue to be people of the Word. When we read, we cultivate a sustained attention span, an active imagination, a capacity for logical analysis and critical thinking, and a rich inner life. Each of these qualities, which have proven themselves essential to free people, is under assault in our TV-dominated culture. Christians, to maintain their Word-centered perspective in an image-driven world, must become readers. This issue of ALETHEIA will depart somewhat from the usual format. I have been reading in a few various controversial areas and would like to respond to each of these. My study of these is certainly not complete but ongoing as must be the case with such things. By responding to particular books in these areas, I am not responding to everything that has been written or that I should have read by now. However, when a book is published you figure that the author has said all that he wanted to say about the subject and so comments about it are justified. In 1988 a paper was published by Doron Witztum, Eliyahu Rips and Yoav Rosenberg of the Jerusalem College of Technology and the Hebrew University on what was called “Equidistant Letter Sequences in the Book of Genesis.” Within the last couple years articles have appeared in Bible Review and other magazines giving certain credence to the “discovery.” More recently (1997, Simon & Schuster) Michael Drosnin, a former Wall Street Journal reporter has published a popular book, The Bible Code and has appeared on many television and radio programs. What would you think if someone told you that major events in history, with definite names and dates, were present in coded message within the Hebrew text of the Old Testament? Adolf Hitler, John Kennedy, Yitzhak Rabin and others were foretold down to some amazing details. Drosnin also claims that future events can be gleaned if one can enter the right information into the computer. The process goes something like this. Starting with the Masoretic Text, each letter is entered into a computer in order as it appears in the Old Testament; no punctuation, spaces between words or vowel pointing. When asked for a reading of any entry (such as a specific name), the computer searches the entire text, arranges it into a huge crossword-like grid or puzzle with the word “Kennedy” for example (in Hebrew, of course), in a lined sequence along with related words such as “Dallas” and even exact dates. In this way the “Bible Code” contains predictions of current events in a text compiled thousands of years ago. The computer rearranges the grid depending on what word has been entered. 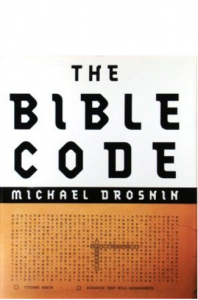 Drosnin is convinced that this “Code” is actually the seven sealed book of Revelation which could not be opened until the technology was in place to open it. Now, he says, it is our responsibility to use what we know to avoid destruction. The next predicted dates for global disaster are 2000 and 2006. There are more than a few obvious concerns about the code. 1) The Masoretic Text is a compilation of textual traditions and cannot be said to represent the originals exactly. There are many Masoretic Texts containing hundreds of variants, any one of which could change the code. 2) The Hebrew language seems more given to such usage than others because it has only 22 letters and no vowels. This would greatly enhance such “sequences” that appear in a line. 3) This reduces the understanding of the Bible to mere mathematics rather than faith. Drosnin, admittedly is not a Christian or a Jew, and yet has become a prophet. 4) The Bible code has not been 100% accurate and that was the mark of a false prophet. 5) There seems to be little regard for what the text of the Old Testament actually said in the words of the books themselves. 6) Revelation specifically says that Jesus himself opens each of the seals on the seven sealed book. It will be interesting to see how much publicity the Bible Code gets. It certainly is a more interesting approach than previous date-setters. I am waiting to hear from Christian Hebrew Scholars on the merits of using the sacred text in this manner.